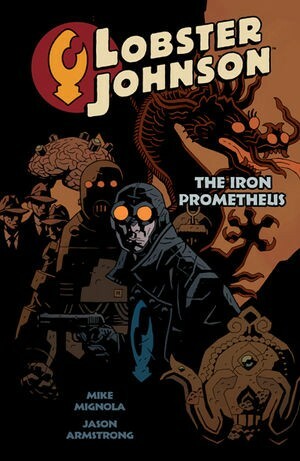 As with previous volumes dipping back into the past, this book has little connection with the Hell on Earth books preceding and succeeding it. It has minor ties to the 1946 and 1947 books, with which it’s gathered in a single hardbound volume, but can also be read without reference to them. A group of scientists are working on atomic bombs as a method of propelling a spacecraft. 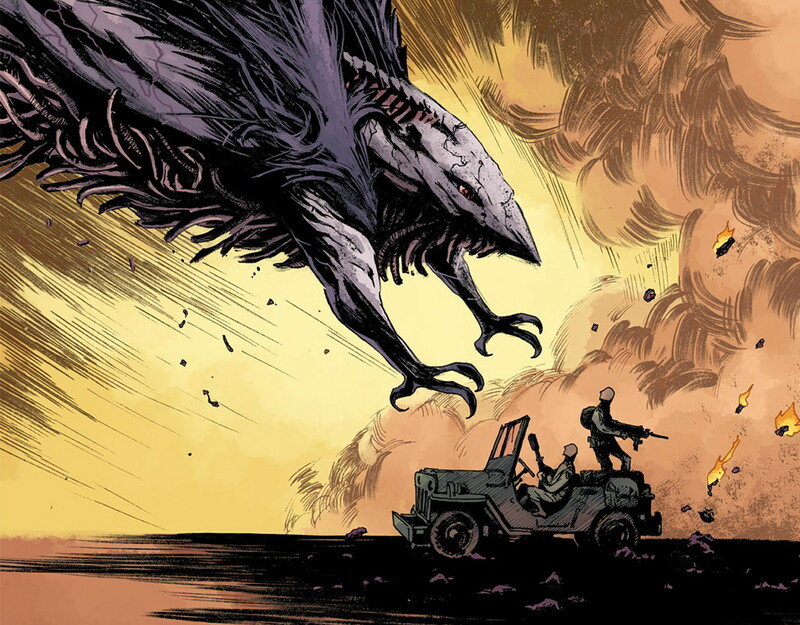 Only one of them notices an anomaly as the prototype is tested, and soon thereafter people start disappearing in the vicinity of the testing base with a giant black flying creature identified as responsible. 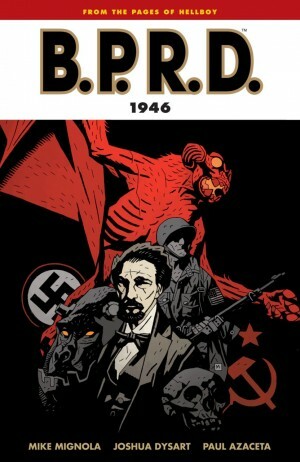 Professor Bruttenholm and the B.P.R.D. are called in when this creature proves untrackable by conventional means. As well as a mystery, Bruttenholm may have found love as he’s rapidly attracted to one Dr Anna Rieu, but as early pages set in the 1980s make clear, that didn’t work out and the remainder of the story explains why. It simultaneously sets up a possible mystery for future exploration. As this occurs the horrible events Simon Anders has experienced appear to be taking their toll, not least due to the treatment required to save him. Other agents consider him strange, and no longer wish to work with him, citing a possible death wish that endangers their lives also. Even Stegner, with whom he’s shared missions no longer considers him reliable. 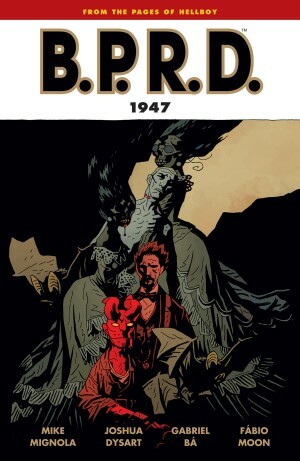 Artist Max Fiumara is far closer in spirit to his 1947 predecessors Gabriel Ba and Fabio Moon than the regular B.P.R.D. art. His people are stylised, awkward and angular, an effect heightened by the viewpoints he adopts and his predilection for long, thin panels. It all adds to the feeling of corners of the eye unease permeating the story. 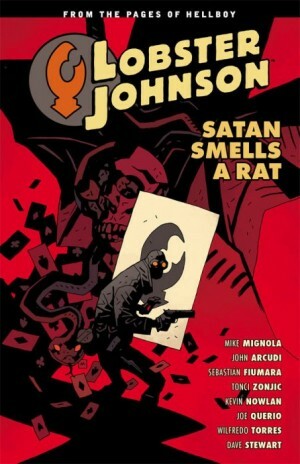 Previous dips into the past have seen Joshua Dysart collaborating with Mike Mignola, but here it’s regular series writer John Arcudi. This isn’t an entirely successful story. Gender politics are an issue, with the capable and passionate Dr Rieu marginalised and patronised by the attitudes of the time, yet aggressive in the face of acceptance, and unable to accept Bruttenholm’s considerable expertise in areas otherwise unknown. The mixture of atomic era optimism with the regular horror tropes is also awkward, the sinister aspects being far less clear cut than, say, Nazi experimentation. The glimpses into the past have devoted increasing amounts of time to Hellboy, then just four years old, but rapidly maturing. There’s a sense of him becoming dissatisfied, and scenes play off this without ever resulting in a grand payoff. That’s maybe to come. 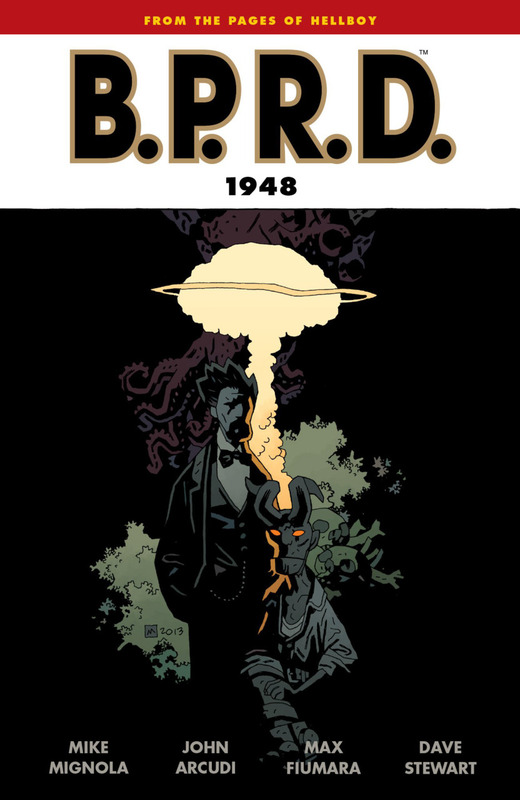 Ba and Moon are back for what is in effect B.P.R.D: 1949, but instead titled Vampire, following up on a character prominent here.